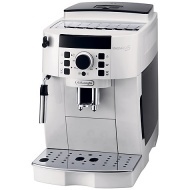 alaTest has collected and analyzed 19 reviews of Delonghi ECAM 21.117.W. The average rating for this product is 4.6/5, compared to an average rating of 4.4/5 for other products in the same category for all reviews. Opinions about the maintenance and noise are generally positive. The design and price are also appreciated, but some have doubts about the size. We analyzed user and expert ratings, product age and more factors. Compared to other products in the same category the Delonghi ECAM 21.117.W is awarded an overall alaScore™ of 89/100 = Very good quality. Good quality product, well built! Very easy to operate makes lovely coffee in a fast time and very easy to keep clean I am very pleased with my purchase and should have had one year's ago. Turned the machine on and noticed that each time I used it, it leaked. After 2 or 3 coffees, it completely packed in, lights flashing and dispencing dry ground coffee. Order a new one and it arrived smashed to pieces. Good work Debenhams!!!! Great looking, easy to use and makes great coffee. On top of that Debenhams offered it at a good price and it was delivered within three days. Well made reliable machines that operate well for years and make great coffee.